Fully automatic submersible electric pump, large support base design to increase stability and the possibility of operation in positions not perfectly perpendicular to the soil. 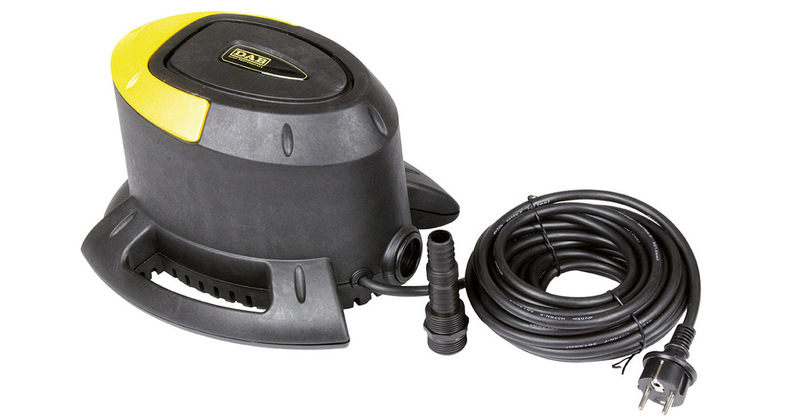 Built-in float for automatic operation; efficient and maintenance-free pump. Suitable for winter use on top of swimming pool covers, to remove rain water and prevent the cover itself from breaking due to the heavy weight of the accumulated water. Operating range: from 0.5 to 6 m³/h with head up to 6.5 metres. Liquid temperature range: from 0 °C to 35 °C (EN 60335-2-41). Installation: fixed or portable, vertical position (max. inclination 10°). Free passage of solids: 5 mm.